When you have children and grandchildren with food allergies and intolerances as we do you start to be on the lookout for treats that they can have. I have a very limited repertoire of suitable recipes so I was really keen to try some new glutenfree, vegan and organic treats which my friend Gill brought over for us to try. And this is how I came to find out about the mythical Baron Hasselselhoff ,alias Clayton McErlane, Chef, Father and Crown Lynn lover who conjures up treats that will appeal to gluten free taste buds with ' a sense of grandeur, pastiche and whimsy ' in his wholesale bakery in Takaka, Golden Bay. Now in my experience gluten free baking can taste too sweet, too dense or too chewy. His gingernuts de luxe did not suffer from any of these .The texture was slightly crumbly but light, nicely spiced with ginger and hint of cardamom. They were reminiscent of Indian sweets but not at all cloyingly sweet . 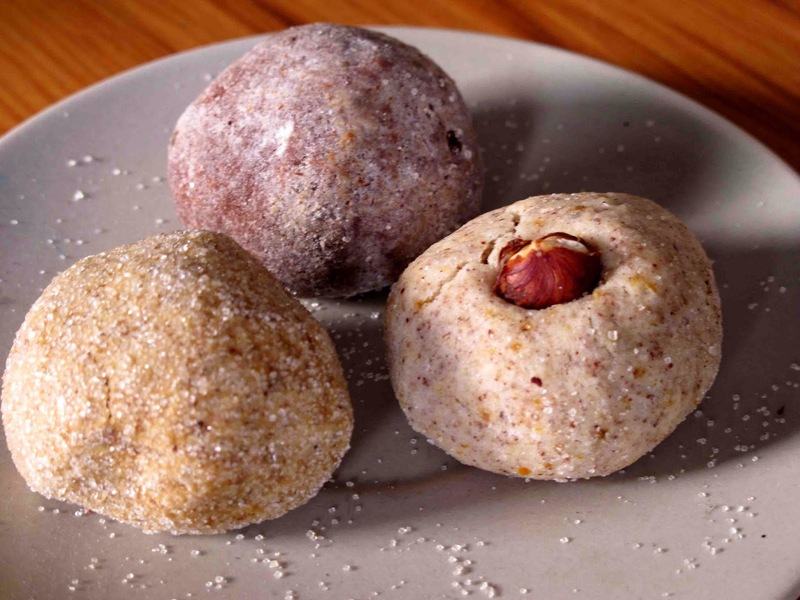 And they are a powerhouse of gluten free and organic ingredients including rice flour, hazelnut flour , tapioca flour, rice syrup,crystalized ginger and cardamom. And I suspect that even my partner who is not gluten free would be won over by their gluten free ginger slice topped with pistachios. But we haven't had the chance to sample that yet! Here's my second all green St Patrick's Day salad, both healthy and festive. 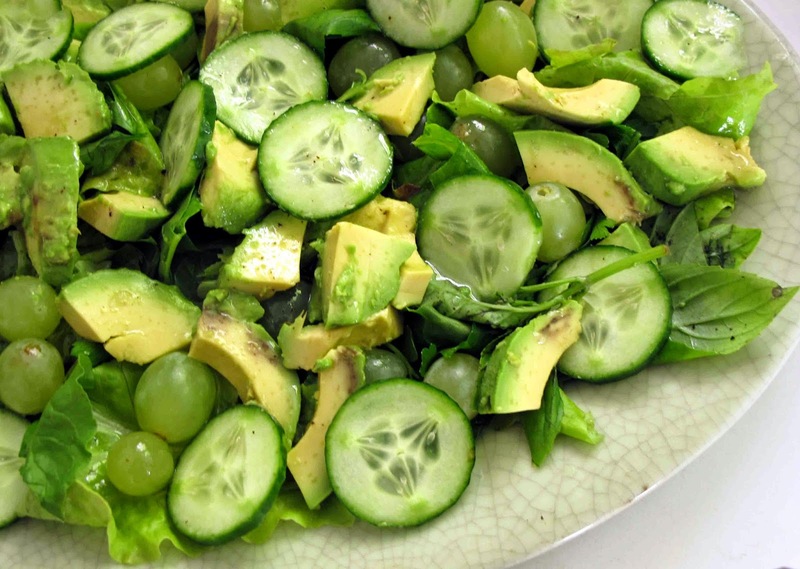 On a bed of mixed lettuce leaves mixed with a little flat parsley casually arrange some seedless green grapes, sliced avocado and rounds of Lebanese cucumber. Dress with olive oil and fresh lemon/lime juice. For a meatless meal add some grilled fish. And having munched on such a healthy meal we'll be drinking a wee dram of whiskey afterwards! Here's my take on a healthy St Patrick's Day recipe, a bowl full of healthy green vegetables and herbs. To make it use a potato peeler to make long noodles from a large courgette and two stalks of celery and half of a large telegraph cucumber. Toss these in some basil pesto, thinned with a little olive oil and lemon juice. 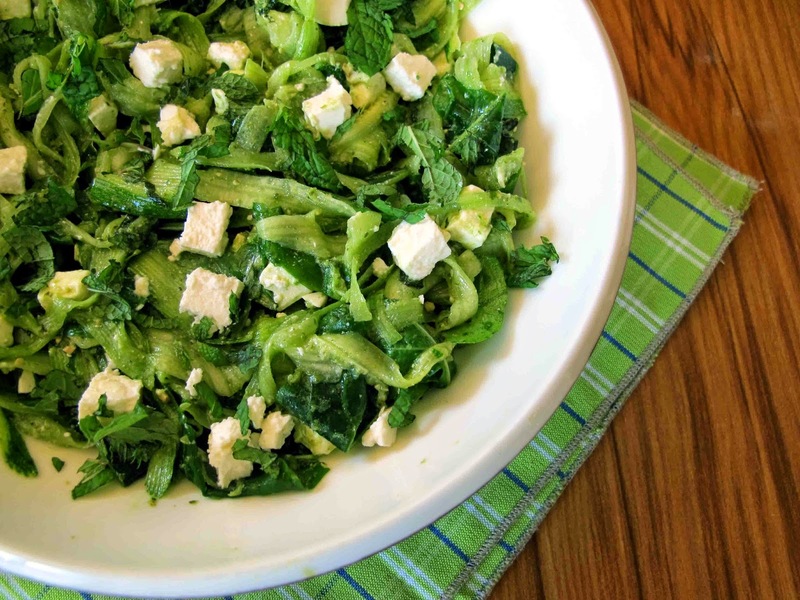 Stir through some rocket leaves, mint and cubes of feta.